Let Proverbs 3:5, which appears on the Trust In The Lord Wirebound Journal, remind you that you when you do not understand suffering or pain, you choose to trust in the Lord. Give the Christian journal to a friend or your sister who could use some encouragement when she journals in the wirebound journal. You'll embolden her not to trust the Lord only for part a of the journey but for all of it - with all her heart. The Proverbs 3:5 Wirebound Journal features wire binding, a hardcover, and 192 lined pages. The hardcover journal features a pink floral design on the cover with gray stripes along the edge of the wirebound journal. Proverbs 3:5 is boldly displayed in the center of the journal, which will encourage the writer to read it each time she reaches to write her thoughts inside the Trust In The Lord Journal. 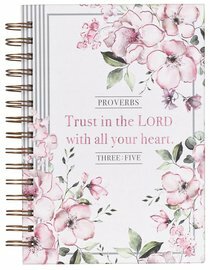 About "Spiral Journal: Trust in the Lord, Pink Floral (Proverbs 3:5)"